BEIRUT -- The Syrian military said on Monday it had gained control of 98 percent of Aleppo, including virtually all of the previously-rebel-held enclave of eastern Aleppo, reducing the rebel territory to a small sliver packed with civilians and fighters squeezed under fire. The military statement came hours after Syrian forces, aided by Shiite militias from Lebanon, Iraq and Iran, took Sheik Saeed, one of the largest neighborhoods in the southern part of the rebel territory, tightening the noose on the enclave. The military also said its multi-pronged ground push on Monday captured the al-Fardous neighborhood, one of the most populated districts to the north of Sheik Saeed. Rami Abdurrahman, the head of the Britain-based Syrian Observatory for Human Rights, said the district remains under fire and that fighting continues there. He estimated that about seven percent of the enclave remains under rebel control. Activists and the United Nations have estimated that as many as 100,000 people remain trapped in the rebel enclave. “The situation is very, very critical,” said Ibrahim al-Haj, a member of the Syrian Civil Defense. “The military took many areas and we are now squeezed.” Al-Haj had been on the move to find a place to keep him and his family away from the clashes and possible government capture. “The collapse is terrifying,” he said in a message to reporters. Tens of thousands of civilians have fled to government-held western Aleppo since the offensive began last month. But tens of thousands remain trapped in the ever-shrinking eastern enclave. 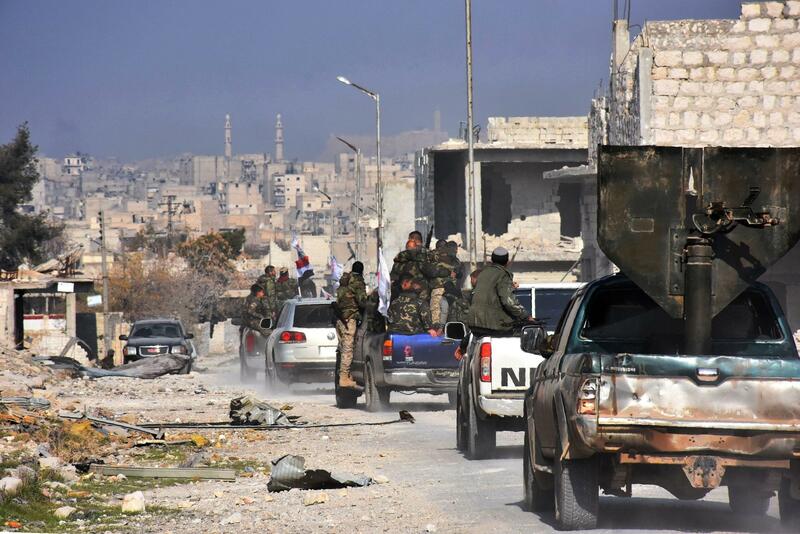 “Regime forces are advancing into Sheikh Saeed, al-Firdaws and Bostan al-Qasr .. they’ve encircled these districts completely,” opposition activist Monther Ataki, who was among those trapped in the shrinking rebel-held territory Monday, told CBS News . “We need international protection right now”. A rebel fighter from inside Aleppo, speaking on condition of anonymity for fear of reprisals, said the fall of Sheik Saeed means the fall of the enclave’s only mill and grains warehouse, which leaves the territory without access to bread or flour. Most of the remaining civilians have now gathered in two or three neighborhoods, packing thousands in a small space and threatening large casualty tolls in any new attack, he said. In a map distributed by the military’s media arm, a small sliver of land, a long rectangular shape in the city center abutting the western, government-held parts of the city, remained in rebel hands. It includes six neighborhoods, most of them still areas where fighting is still underway. A Turkey-based Syrian organization that supported a number of medical facilities and agricultural projects in Aleppo said it was terminating all its activities in the besieged enclave because all of its eight ambulances have been destroyed. The Shafak organization said 47 of its 57 staff are stuck in areas still under rebel control and that it has lost communication with most of them. The group ran a U.N.-funded primary health care facility in al-Fardous before it was captured by the government, along with Shafak’s warehouses elsewhere in eastern Aleppo that stored fuel and medical supplies. Syrian troops backed by Russian airstrikes and militias from across the region launched a wide-scale offensive on eastern Aleppo last month and are on the verge of driving the rebels from the city. Doing so would hand President Bashar Assad his greatest victory yet in the Syrian civil war, now in its sixth year. The offensive to retake rebel-held eastern Aleppo, which began on Nov. 26, followed an intensive aerial bombing campaign that knocked out most of the eastern sector’s medical facilities, targeted civil defense and municipal vehicles and blocked roads with rubble. The eastern Aleppo rebel enclave was cut off from outside aid since July by a government siege. Earlier on Monday morning, state TV aired footage from Sheik Saeed, one of eastern Aleppo’s largest neighborhoods bordering some of the most crowded districts. A residential area, Sheik Saeed also has open agricultural fields that often gave an advantage to rebels fighting off past government advances. The Observatory said government forces continued their bombing of the remaining rebel areas on Monday, including airstrikes on Bustan al-Qasr, near the government-controlled western part of Aleppo, and al-Fardous. The military later announced it seized al-Fardous. State TV has lately been broadcasting every day images of hundreds of civilians fleeing areas where troops are advancing, pouring into western Aleppo. Those areas are only accessible through government-monitored crossing points. A total rebel defeat in Aleppo, Syria’s largest city and once its commercial center, would reverberate across the war-torn country, where opposition forces continue to hold out in smaller, scattered areas. It would cap a string of government successes over the past year and provide a turning point in a war that has killed more than a quarter of a million people, displaced more than half of the country’s population and defied all international efforts for a political solution.